The Bookmark is a used bookstore in beautiful Old Oakland run by the Friends of the Oakland Public Library. Proceeds from book sales provide vital support to the Library: in 2018-19, the Friends granted $215,000 to the Library's various programs and branches. The store is open Monday-Friday 10:30-5:30, Saturday 10:30 - 3:30, and Sunday 10:30-2:00. Not all shifts are in need of new volunteers, but the situation changes often -- please inquire if are interested and have some regular time in your schedule to commit. 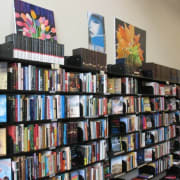 Bookstore volunteers do a variety of chores during their three hour-per-week shifts, such as: receiving, unpacking and pricing donations; shelving new books and culling old stock; keeping certain areas alphabetized; general upkeep, and most importantly - ringing up sales. One of the best parts of the job is simply chatting with our customers and other staffers about books, books, books! Come join our fun and dedicated team of library boosters!